No. 1, Jalan Industri USJ 1/3, Taman Perindustrian USJ 1, 47600 Subang Jaya, Selangor, Malaysia. 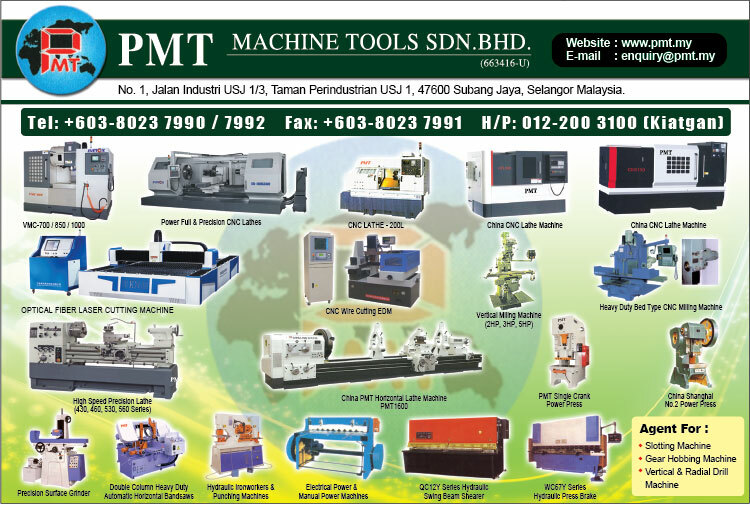 PMT Machine Tools Sdn Bhd is established in 2004 and we are a trading company dealing in all sorts of machineries. We are the authorized agent for EVEROX CNC Machining Centers, CNC Lathes and Heavy Duty Bed Type Milling Machines. We also have Conventional Lathes, MILLMATE CNC and Conventional Milling, Surface Grinder and Power Press Machines. Most of the machines are from Taiwan. We even have China machinery i.e. BAOJI Conventional Lathe, DEZHOU Heavy Duty Conventional Lathe, Vertical & Radial Drilling Machines and Shanghai No. 2 factory Power Press. At PMT Machine Tools, we have skilled technicians and programmers to back our customers on after sales and service matters. Besides machines, we also have tooling and accessories to serve our customers better. Finally, last but not least we strive to serve our customers at our very best and a good service.